Effective onboarding can make the difference between employee success or failure. Workforce management can improve the chances of turning that new hire into a big win. Workforce management solutions can even make onboarding easy. Companies large and small are realizing that onboarding is a critical step in hiring. Companies with organized onboarding processes experience less turnover. They also enjoy higher customers satisfaction rates and product quality. There are a lot of good reasons to establish a formal onboarding protocol. There are also a lot of areas to cover that many companies forget to include. Modern onboarding is more about long-term sustainability and less about simple orientation. Modern onboarding includes the usual suspects such as the campus tour. Employees need to know their surroundings and how to navigate the workplace. These basics are important and go a long way to helping new employees get comfortable. Simple orientation, though, isn’t cutting it anymore. Today’s onboarding includes everything from understanding the company’s branding to customer service protocols. Modern organizations understand, too, that onboarding is a long-term process. Most employees will still experience an orientation meeting. Orientation is only the beginning of a lengthy process of education and adoption. Company policy and procedures are at the root of onboarding. So are elements of routine such as payroll processing and time and attendance. Certifications and deeper company experience add layers of complexity to ongoing onboarding processes. One of the ways modern managers are dealing with onboarding complexity is software. Workforce management solutions offer easy ways to manage complex processes. Some of them automatic. Cloud-based workforce management solutions are easy to adopt and install. They help managers automate the process of onboarding and help employees complete tasks. Before: the time before a new hire shows up for the first day. During: orientation and the next two weeks. After: ongoing reinforcement of policies and procedures. These three phases contain critical steps in the onboarding process. Each is important in the development of your new employee. Workforce management solutions will help you optimize these phases and improve efficacy. Following are some examples of how workforce management can help make onboarding easy. When an employee comes in for their first day of orientation, they are an unstable storm of emotion. Posturing reduces focus to all the wrong things. Apprehension almost ensures that new employees won’t remember a thing. With an avalanche of paperwork and employee forms to file, it’s no wonder they go home confused. This is a great reason to start your employees before they get to orientation. Workforce management solutions with employee self-service can make this process easier. They can also speed things up so you aren’t so focused on paperwork. By the time your employees arrive for their first day, they can have all the paperwork out of the way. Before an employee arrives for their first day, add them to your system. Send their workforce management login as part of their welcome aboard letter. Ask them to log in. When an employee logs into the workforce management hub, they receive instructions. Instructions can include the completion of forms and reviewing the company handbook. Document management features can track their progress and ensure they complete items. Employees can submit forms online and apply for benefits in the hub. Managers can confirm completion of reading assignments with automatic alerts. By the time your new hire arrives for orientation, you can confirm that all paperwork is complete. Employees can confirm their completion of the employee manual. By the time you start your orientation meeting, everyone is on the same page. When employees complete paperwork in advance, orientation can focus on supporting job roles. Workforce management software can take the burden from managers. Orientation is now easier and more effective, right from the start. For employees who don’t finish with pre-orientation paperwork, self-service allows personal followup. Employees can log into their hub at any time and complete paperwork. Managers won’t have to follow up in person and can manage from the workforce management hub. With paperwork out of the way, employees can spend orientation time learning procedures. With workforce management solutions, orientation can be faster and easier. After a quick tour and introduction of corporate execs, it’s time to get to business. Orientation should focus on introducing employees to internal systems that help workflow. Systems such as time and attendance and scheduling will become their central utility. These are both parts of your modern workforce management solution. Using the workforce management system as your orientation backdrop assures focus. Orientation is a good time to introduce new employees to the attendance policy. Payroll makes a good leverage point to enforce time and attendance procedures. Workforce management handles time and attendance and helps employees make that connection. The importance of payroll will help reinforce good time tracking habits. Scheduling is also handled by workforce management solutions. Orientation is a good time to introduce employees to self-service management. With self-service access to the workforce hub, employees can manage their own schedule. Workforce management is the framework for orientation. Managers have a consistent backdrop for policy. Employees have a trusted resource for company policy and procedure. This will help transition new employees into the company over the next two weeks. Employees will become familiar with the workforce management solution as they use it. Managers can address questions through the internal communications. Employees will learn to rely on self-service access to documents and schedules. Management rests assured that employees have the resources they need to be successful. Workforce management provides an easy, consistent way to train and inform. Ongoing communications are all handled in the system. Workforce management solutions go a long way toward streamlining orientation. Easy. Onboarding continues long after the employee orientation. Workforce management solutions ease employee communications and ongoing policy enforcement. They also reinforce good time and attendance habits. Workforce management solutions can help extend onboarding initiatives well beyond orientation. This is a competitive advantage for dynamic companies experiencing constant change. Change can sometimes be a contributing factor to instability. Workforce management provides a trusted counter-balance to change by providing consistency. Companies that provide employees with trusted consistent resources enjoy greater stability. Greater stability for employees means a happier workforce. When your employees are happy, policy adoption and trust become inherent. Your onboarding routine can continue beyond your initial orientation. Workforce management provides the platform to continue building trust and consistency. 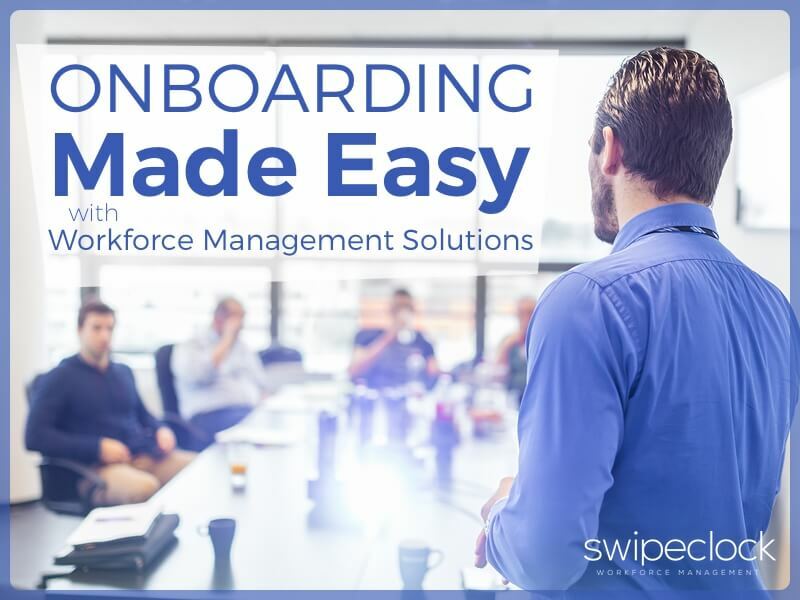 Employee onboarding is easier with workforce management solutions. Replace your manual onboarding tasks with workforce management. Automated time and attendance will help reinforce productive employee habits. Employee self-service will empower employees to contribute to administrative oversight. Online document management provides a reliable, consistent platform for information delivery. Document tracking helps assure that employees are adopting policies and procedures. A workforce built on workforce management becomes a trustable network of productive employees. WorkforceHUB™ from SwipeClock is a workforce management solution for any sized business. Time and attendance tools in WorkforceHUB help reinforce successful time tracking habits. WorkforceHUB also includes scheduling and document management features. This helps make onboarding easy, productive, and lasting.